The line is characterised by traditional Italian craftsmanship, passion and an intense love of detail. The extensive expertise and an unsurpassed balance between elegance and street style seal the deal. It all comes together in an unconventional design that has everyone talking. The brand's collections, Vitesse, Memento Audere Semper, Nulla Ethica Sine Aesthetica, Audacia, Met-Ro, She loves you and Semper Adamas, all impress with their variety in colour and design. 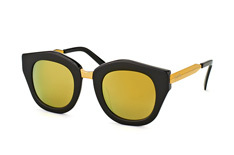 You can find a selection of the brand's most compelling sunglasses on our online store.